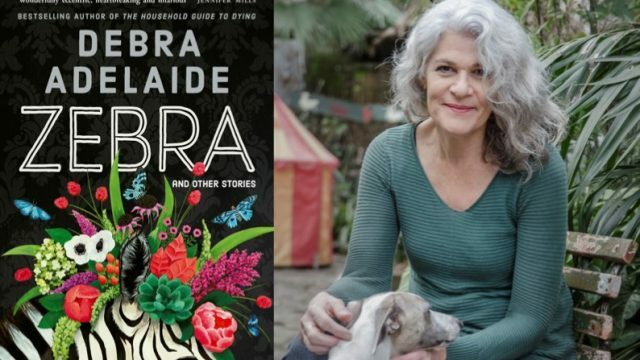 ‘Zebra’ is a collection of feelings, and narrative, linked by an obvious truth: Debra Adelaide is a deft author worthy of our national acclaim. There are worlds of enjoyment to be found in this collection of short stories, plus a stirring, vivid and timely novella (the titular Zebra) from Australian author Debra Adelaide. The collection is structured into three parts, where the stories are told from the first, then second, then third person narrative. It begins with a tale of a dead body buried in a suburban backyard. Then onto a tale of escape; an analysis of grief, a story surrounding Bennelong, and one particularly brutal—and savagely funny—guide to surviving Christmas. The bulk of the collection is the eponymous novella, a story of a nameless Australian PM, a woman (gasp!) who finds herself in possession of a zebra at the same time as she confronts and deals with a particularly surly and verbally abusive neighbour. It’s here that Debra Adelaide’s human insights and powers as a writer come to the fore. The greatest strength in her writing (and this is an author with many arrows in her quiver) is her pervasive use of metaphor. I’m often wrong about a lot of things, it turns out, but reading Zebra suggested to me a structure and narrative device like Yan Martel’s Life of Pi—the animals in that tale were representative of people in Pi’s life. I’m going to go ahead and assume that the titular zebra takes on more than just the form of an exotic animal—we have in the central character a female Australian PM who is dealing with a) the running of a country and its ensuing stresses and pressures, and b) the unbalanced expectations of women in power. So this woman in power is someone with fears, desires, wants, and because of her position, she’s unable to act on many of them because of public perceptions. The zebra is more than just a zebra, methinks. Or, it is in fact just a zebra. The choice is yours, and this too is a testament to Ms Adelaide’s deft literary hand. The collection is an insightful, sometimes heartbreaking, always eye-opening, occasionally brutally honest series of tales in and around the Australian existence. Heartily recommended.